"SA-10" redirects here. For the PDP-10 computer interface to IBM storage, see Systems Concepts. For the 1965 Apollo test mission, see AS-105. "Grumble" redirects here. For the complaint, see Wiktionary:grumble. The S-300 (NATO reporting name SA-10 Grumble) is a series of initially Soviet and later Russian long range surface-to-air missile systems produced by NPO Almaz, based on the initial S-300P version. The S-300 system was developed to defend against aircraft and cruise missiles for the Soviet Air Defence Forces. Subsequent variations were developed to intercept ballistic missiles. The S-300 system was first deployed by the Soviet Union in 1979, designed for the air defence of large industrial and administrative facilities, military bases and control of airspace against enemy strike aircraft. The system is fully automated, though manual observation and operation are also possible. Components may be near the central command post, or as distant as 40 km. Each radar provides target designation for the central command post. The command post compares the data received from the targeting radars up to 80 km apart, filtering false targets, a difficult task at such great distances. The central command post features both active and passive target detection modes. S-300 anti-aircraft missile system at the Victory Parade, Red Square, 9 May 2009. 1975–2011 (for PS and PM) V/F - free. The project-managing developer of the S-300 is Almaz-Antey. 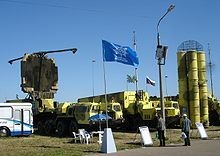 S-300 uses missiles developed by both MKB "Fakel" and NPO Novator design bureaus (separate government corporations, previously named "OKB-2" and "OKB-8"). Serial production started in 1975. The tests have been completed in 1978 (P) and 1983 (V + 1987 for anti-ballistic V). Numerous versions have since emerged with different missiles, improved radars, better resistance to countermeasures, longer range and better capability against short-range ballistic missiles or targets flying at very low altitude. There are currently three main variations. The S-300P (transliterated from Russian С-300П, NATO reporting name SA-10 Grumble) is the original version of the S-300 system which became operational in 1978. In 1987, over 80 of these sites were active, mainly in the area around Moscow. The P suffix stand for PVO-Strany (country air defence system). An S-300PT unit consists of a 36D6 (NATO reporting name TIN SHIELD) surveillance radar, a 30N6 (FLAP LID) fire control system and 5P85-1 launch vehicles. The 5P85-1 vehicle is a semi-trailer truck. Usually a 76N6 (CLAM SHELL) low altitude detection radar is also a part of the unit. It was originally intended to fit the Track Via Missile (TVM) guidance system onto this model. However, the TVM system had problems tracking targets below 500 m. Rather than accept the limitation, the Soviets decided that the tracking of low altitude targets was a must and decided to use a pure command-guidance system until the TVM head was ready. This allowed the minimum engagement altitude to be set at 25 m.
The S-300PS/S-300PM (Russian С-300ПC/С-300ПМ, NATO reporting name SA-10d/e) was introduced in 1985 and is the only version thought to have been fitted with a nuclear warhead. This model saw the introduction of the modern TEL and mobile radar and command-post vehicles that were all based on the MAZ-7910 8 × 8 truck. This model also featured the new 5V55R missiles which increased maximum engagement range to 90 km (56 mi) and introduced a terminal semi-active radar homing (SARH) guidance mode. The surveillance radar of these systems was designated 30N6. Also introduced with this version was the distinction between self-propelled and towed TELs. The towed TEL is designated 5P85T. Mobile TELs were the 5P85S and 5P85D. The 5P85D was a "slave" TEL, being controlled by a 5P85S "master" TEL. The "master" TEL is identifiable thanks to the large equipment container behind the cabin; in the "slave" TEL this area is not enclosed and is used for cable or spare tyre storage. The S-300PMU-1 (Russian: С-300ПМУ-1, US DoD designation SA-20A, NATO reporting name SA-20 Gargoyle) was also introduced in 1993 with the new and larger 48N6 missiles for the first time in a land-based system and introduced all the same performance improvements from the S300FM version including the increased speed, range, TVM guidance and ABM capability. The warhead is slightly smaller than the naval version at 143 kg (315 lb). This version also saw the introduction of the new and more capable 30N6E TOMB STONE radar. The S-300PMU-1 was introduced in 1993 and for the first time introduces several different kinds of missiles in a single system. In addition to the 5V55R and 48N6E missiles the S-300PMU-1 can utilise two new missiles, the 9M96E1 and 9M96E2. Both are significantly smaller than the previous missiles at 330 and 420 kg (730 and 930 lb) respectively, and carry smaller 24 kg (53 lb) warhead. The 9M96E1 has an engagement range of 1–40 km (0.62–25 mi) and the 9M96E2 of 1–120 km (0.62–75 mi). They are still carried 4 per TEL. Rather than just relying on aerodynamic fins for manoeuvring, they use a gas-dynamic system which allows them to have an excellent probability of kill (Pk) despite the much smaller warhead. The Pk is estimated at 0.7 against a tactical ballistic missile for either missile. The S-300PMU-1 typically uses the 83M6E command and control system, although it is also compatible with the older Baikal-1E and Senezh-M1E CCS command and control systems. The 83M6E system incorporates the 64N6E (BIG BIRD) surveillance/detection radar. The fire control/illumination and guidance radar used is the 30N6E(1), optionally matched with a 76N6 low altitude detection radar and a 96L6E all altitude detection radar. The 83M6E command and control system can control up to 12 TELs, both the self-propelled 5P85SE vehicle and the 5P85TE towed launchers. Generally support vehicles are also included, such as the 40V6M tow vehicle, intended for lifting of the antenna post. The S-300PMU-2 Favourite (Russian: С-300ПМУ-2 Фаворит – Favourite, DoD designation SA-20B), introduced in 1997 (presented ready 1996), is an upgrade to the S-300PMU-1 with range extended once again to 195 km (121 mi) with the introduction of the 48N6E2 missile. This system is apparently capable against not just short range ballistic missiles, but now also medium range ballistic missiles. It uses the 83M6E2 command and control system, consisting of the 54K6E2 command post vehicle and the 64N6E2 surveillance/detection radar. It employs the 30N6E2 fire control/illumination and guidance radar. Like the S-300PMU-1, 12 TELs can be controlled, with any mix of 5P85SE2 self-propelled and 5P85TE2 trailer launchers. Optionally it can make use of the 96L6E all altitude detection radar and 76N6 low altitude detection radar. A version titledHQ-15 is currently in Chinese service. Close up view of SA-N-6 launchers on Marshal Ustinov. The S-300F Fort (Russian С-300Ф Форт, DoD designation SA-N-6, F suffix for Flot, Russian for fleet) was introduced in 1984 as the original ship-based (naval) version of the S-300P system developed by Altair with the new 5V55RM missile with range extended to 7–90 km (4.3–56 mi; 3.8–49 nmi) and maximum target speed up to Mach 4 while engagement altitude was reduced to 25–25,000 m (82–82,021 ft). The naval version utilises the TOP SAIL or TOP STEER, TOP PAIR and 3R41 Volna (TOP DOME) radar and utilises command guidance with a terminal semi-active radar homing (SARH) mode. Its first installation and sea trials were on a Kara class cruiser and it is also installed on Slava class cruisers and Kirov class battlecruisers. It is stored in eight (Slava) or twelve (Kirov) 8-missile rotary launchers below decks. The export version of this system is known as Rif (Russian Риф – reef). The NATO name, found also in colloquial use, is "Grumble". Both naval versions are believed to include a secondary infrared terminal seeker, similar to the newer US Standard missile system, probably to reduce the system's vulnerability to saturation. This also allows the missile to engage contacts over the radar horizon, such as warships or sea-skimming anti-ship missiles. The 9K81 S-300V Antey-300 (Russian 9К81 С-300В Антей-300 – named after Antaeus, NATO reporting name SA-12 Gladiator/Giant) varies from the other designs in the series. This complex is not part of the C-300, including is designed by another developer. It was built by Antey rather than Almaz, and its 9M82 and 9M83 missiles were designed by NPO Novator. The V suffix stands for Voyska (ground forces). It was designed to form the top tier army air defence system, providing a defence against ballistic missiles, cruise missiles and aircraft, replacing the SA-4 Ganef. The "GLADIATOR" missiles have a maximum engagement range of around 75 km (47 mi) while the "GIANT" missiles can engage targets out to 100 km (62 mi) and up to altitudes of around 32 km (20 mi). In both cases the warhead is around 150 kg (330 lb). While it was created from the same project, hence the common S-300 designation, different priorities resulted in a design quite different from the other versions. 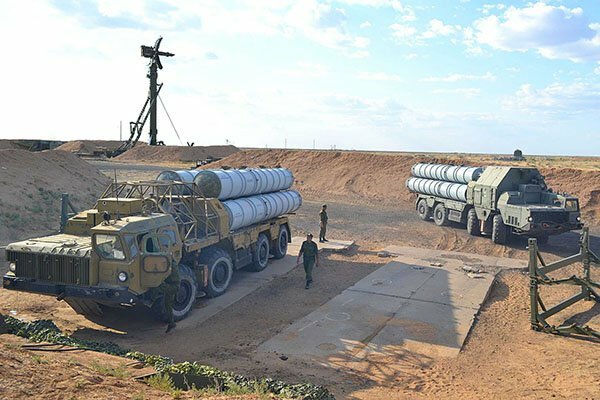 The S-300V system is carried on tracked MT-T transporters, which gives it better cross-country mobility than even the S-300Ps on 8 × 8 wheeled transporters. 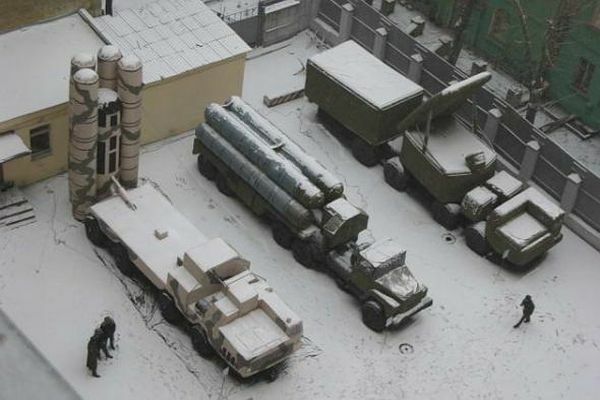 It is also somewhat more distributed than the S-300P's. For example, while both have mechanically-scanning radar for target acquisition (9S15 BILL BOARD A), the battery level 9S32 GRILL PAN has an autonomous search ability and SARH delegated to illumination radar on TELARs. The early 30N6 FLAP LID on the S-300P handles tracking and illumination, but is not equipped with an autonomous search capability (later upgraded). 9S15 can simultaneously carry out an active search for goals (3 coordinates) and passive (2 position). Chance to destroy a target by using single missile an interceptor (The official source) Adopted in service in 1983 (1983 just using the missile 9M83), fully accepted in 1988. 9S15M - 10 m2 - 330 km and 3 m2 - 240 km. 9S19M2 - 175 km (? m2) and two passive electronically scanned array, very high resistance to interference. Also called S-300VMD. Reportedly capable of targeting AWACS aircraft at a very large distances. Different versions of the NPO Novator 9M82MD S-300V4 missiles have a range of 400 km at Mach 7.5 or a range of 350 km at Mach 9 and can destroy maneuvering targets even at very high altitudes. Gladiator rockets significantly less. An export version exists, marketed as the Antey-4000. Missiles are guided by the 30N6 FLAP LID or naval 3R41 Volna (TOP DOME) radar using command guidance with terminal semi-active radar homing. Later versions use the 30N6 FLAP LID B or TOMB STONE radar to guide the missiles via command guidance/seeker-aided ground guidance (SAGG). SAGG is similar to the Patriot's TVM guidance scheme. The earlier 30N6 FLAP LID A can guide up to four missiles at a time to up to four targets, and can track up to 24 targets at once. The 30N6E FLAP LID B can guide up to two missiles per target to up to six targets simultaneously. Targets flying at up to Mach 2.5 can be successfully engaged or around Mach 8.5 for later models. One missile can be launched every three seconds. The mobile control centre is able to manage up to 12 TELs simultaneously. Compared. C-300 its own listed above. Includes powerful 91N6E Anti – stealth range 150, RCS 4scm 390 km, 0.4 m2 for 240 km. Extrasystemic Radar multiply ability. Approximately 4-fold. United against all targets "Niobium" RLS (not excluding ballistic or stealth). Mobility 5 minutes. Frequency band S and UHF. Detection range of 600 km (1 sqm to 430 km), the target speed of 8000 km / h, 4791 miles, Mach 6.35. For detection, the owner of the state to transfer command of targeting items (in this application, the maximum speed grows from subordinates systems). Stealth. Quote - However, U.S. Air Force officials were dismissive of the technique. “Just because something is technically possible doesn't make it tactically feasible,” one Air Force official with extensive stealth aircraft experience explained. All locators "Nebo" family have a double for the army air defence. The system has put in strong performances in real-world exercises. In 1991, 1992 and 1993, various versions of the S-300 had successfully destroyed ballistic missiles and other objects in exercises, with a high success rate (90% or more if 1 missile interceptor is used). In 1995, it was the first system in the world to successfully destroy a R-17 Elbrus Scud missile in the air. China is to test the S-300PMU2 effectiveness in destroying targets in real exercises. This UAV (4.6 km) and simulator a strategic bomber aircraft (186 km), tactical missile (range of the system to the point of interception 34 km and a height of 17.7 km) and also against pinpoint missile. Although none of the S-300 versions have fired a missile in a conflict, it is considered a very capable SAM system that poses a significant hazard even to the most advanced aircraft or other airborne targets. In April 2005, NATO had a combat exercise in France and Germany called Trial Hammer 05 to practice Suppression of Enemy Air Defenses missions. Participating countries were pleased that the Slovak Air Force brought a S-300PMU along, providing a unique opportunity for NATO to become familiar with the system. Israel's purchase of F-35 Lightning II fighters was allegedly motivated in part to nullify the threat of S-300 missiles that were, at the time the fighters were initially sought, subject to a potential arms sale to Iran. After a Russian Sukhoi Su-24 was shot down over Syria in November 2015, Russia deployed S-300 and S-400 to the region - some to the Khmeimim Air Base, some with the Russian cruiser Moskva. On 28 September 2018, shortly after Moscow accused Israel of indirectly causing the downing of a Russian military jet in Syria, which killed 15 Russian service members, Russia announced that, to keep its troops safe, it started to supply Syria with modern S-300 anti-missile rocket systems. Israeli Prime Minister Benjamin Netanyahu objected to the move in a telephone call with Russian president Vladimir Putin, stating that the delivery of S-300 anti-missile rocket systems to "irresponsible players" would be dangerous for the region. Belarus – S-300PS systems delivered from Russia in 2007 to replace older S-300 model in Belarusian inventory. Four divisions of S-300 missiles to be delivered in 2014. Bulgaria – ten S-300 launchers, divided into two units with five launchers each. People's Republic of China – China was the first customer of S-300PMU-2. China also built the HQ-15 with the maximum range upgraded from 150 to 200 km (93 to 124 mi). The total number of the S-300PMU/1/2 and HQ-15/18 batteries in PLA are approximately 40 and 60 respectively, as of 2008. The total number of the missiles is well above 1,600, with about 300 launcher platforms. Five such SAM battalions are deployed and in active duty around Beijing region, six battalions in Taiwan strait region and the rest in major cities like Shanghai, Chengdu and Dalian. Two Rif (SA-N-6) systems were purchased in 2002 for the Chinese Navy for the Type 051C destroyers. By 2011, it had obtained 15 battalions (4 systems) of the S-300PMU-2. Egypt – The S-300VM "Antey-2500" missile system was ordered in 2014, as part of a multi-billion Egyptian-Russian arms deal signed later that year. The $1 billion contract comprises 4 batteries, a command post and other external elements. In 2015, Russia started delivering the system components, Egyptian soldiers began their training in Russian training centers. By the end of 2017, all batteries were delivered to Egypt. Russia is in talks with Egypt on the delivery of additional Antey-2500 systems. Greece – S-300 PMU1 system acquired after the Cyprus Missile Crisis and operated by HAF on Crete consisting of 1 Battalions/4 batteries/16 launchers / 80 missiles. Greece first fired an S-300 during the White Eagle 2013 military exercise, which was the first time it was used since it had been bought 14 years earlier. Iran - Originally purchased in 2007, Iran’s S-300 order was blocked until April 2015 when the Kremlin lifted its self-imposed ban on the sale due to the international lifting of some sanctions against Iran. The country purchased and received an unknown number of S-300s (probably the S-300PMU2 system, a modified version of the S-300PMU1) in 2016, it was fully tested and implemented in 2017. 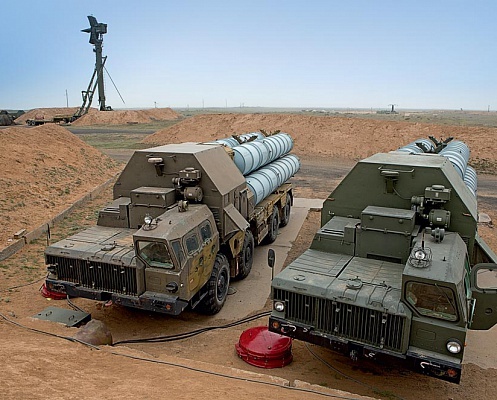 Iran received four S-300PMU2 batteries from Russia in 2016, each consisting of a 96L6E target acquisition radar, a 30N6E2 target engagement radar, and four 5P85TE2 towed transporter-erector-launchers (TELs). These systems are supported by two 64N6E2 battle management radars and linked using FL-95 antenna masts. Iran also owns an unknown number of the domestically produced type Bavar 373, developed before the arrival of Russian S-300 systems. S-300s are operated by the Islamic Republic of Iran Air Defense Force. Russia – All variations. (1900 (S-300PT/PS/PMU, 200 S-300V/S-300V1 in 2010 year)), 2000 in total launchers. All production in 1994 (actually 1990) or older, all the complexes S-300PM have been repairing and upgrading (Favorite-S). S-300P/PT have been retired before 2008, some S-300PS in service, but were to be retired in 2012–2013. Modernization of all units of the version S-300P to the version S-300PM1 was to end in 2014. Resource of each taken increased by 5 years. PM 1 continued to version PM 2. By 2015 S-300V4 was to have been delivered. Modernization of all S-300V to the version S-300V4 was to end in 2012. Slovakia – One battery S-300PMU and 48 missiles type 5V55R inherited from Czechoslovakia. 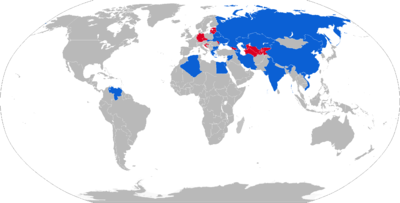 3 missiles were fired during exercise in Bulgaria in 2015. Syria - An order for 6 systems was signed in 2010. Syrian crews underwent training in Russia and some of the S-300 components were delivered to Syria in 2013. Later, due to the weapons trade embargo against Syria and on request of Israel the deliveries were halted. [a] After the Russian Su-24 shootdown in November 2015, batteries of the S-300 missile system were officially deployed in the Latakia province for protection of the Russian naval base and warships in Tartus. These are operated by Russian crews. Russia was reconsidering the deliveries of the S-300 to Syria after the missile strikes against Syria in April 2018, but this did not happen. Following the downing of Russian Il-20 aircraft in Syria in September 2018, for which Russia held Israel responsible, Russian defense minister Sergey Shoygu on 24 September said that within two weeks, the Syrian Army will receive S-300 systems. Though the variant was not specified, the stated range of the system is to be 250 km. On 2 October 2018, Sergey Shoygu told president Vladimir Putin during a meeting broadcast that the delivery of the S-300 system to Syria had been completed a day prior. On 8 October 2018, Russian news agency TASS reported that three S-300PM battalions had been given to Syria free of charge, citing "On 1 October three battalion sets of S-300PM systems of eight launchers each were delivered to Syria,". According to the source, the deliveries also included more than 100 surface-to-air missiles for each battalion. It is operated by the Syrian Air Defense Force. Ukraine – S-300PS, S-300PMU, S-300V and others. Only six systems have been repaired since 2004; as a result only 40% of Ukrainian S-300 systems were in good condition prior to 2014. The crisis with Russia resulted in a program of accelerated modernisation, with at least 4 batteries overhauled in the period 2014-15. 34 launchers remained in the Crimea after 2014 Russian annexation of Crimea. Venezuela - Ordered 2 battalions of S-300VM "Antey-2500", delivered in May 2012. Vietnam - Bought two S-300PMU-1 for nearly $300 million and RLS 96L6 after 2009. Bought S-300 PMU-2 in 2012. Czechoslovakia – One battalion created in 1990. Passed to Slovakia in 1993. East Germany – Passed on to West German Army. Germany – Retired after re-unification. United States – S-300P purchased from Belarus (1994). The system was devoid of electronics. S300V was purchased in Russia officially in the 1990s[clarification needed] (complete set (except for 9S32 GRILL PAN multi-channel guidance radar)). Cyprus – S-300 PMU1 system transferred to Greece after the Cyprus Missile Crisis and operated by HAF on Crete. ^ a b c "Almaz/Antei Concern of Air Defence S-300P (NATO SA-10 'Grumble') family of low to high-altitude surface-to-air missile systems". Jane's. 16 January 2008. Retrieved 4 August 2008. ^ "Big Russian flotilla led by Admiral Kuznetsov carrier heads for Syrian port". DEBKAfile. 21 August 2008. Retrieved 22 August 2008. ^ a b c "Кремль опроверг информацию о готовности РФ поставить Ирану С-300". KM.RU Новости - новости дня, новости России, последние новости и комментарии. Retrieved 1 April 2015. ^ "ЦАМТО / Новости / Прекращение производства ЗРС С-300 касается систем С-300ПС и С-300ПМ". armstrade.org. 23 August 2011. Retrieved 1 April 2015. ^ Редактор. "Комплекс С-300В впервые поразил мишени-имитаторы ОТБР". army-news.ru. Retrieved 27 November 2015. ^ "Авиация НАТО против сирийских С-300". topwar.ru. Retrieved 1 April 2015. ^ "Зенитно ракетный комплекс С-300 ПМУ-1". kapyar.ru. Retrieved 1 April 2015. ^ a b c "Зенитно-ракетная система С-300В (СССР/Россия)". modernarmy.ru. Retrieved 27 November 2015. ^ "International Assessment and Strategy Center > Research > Almaz S-300 – China's "Offensive" Air Defense". Strategycenter.net. 25 February 2006. Archived from the original on 28 September 2011. Retrieved 14 November 2011. ^ a b "Система С-300П". soldiering.ru. Retrieved 1 April 2015. ^ "Encyclopedia Astronautica – "S-300"". Archived from the original on 30 April 2010. Retrieved 5 September 2008. ^ a b "Anti-Aircraft Missiles & Systems, ракеты и системы ПВО России". Inbsite.com. Archived from the original on 23 December 2012. Retrieved 13 August 2012. ^ "S-300/Favorit (SA-10 'Grumble'/SA-20 'Gargoyle')". Jane's. 8 February 2008. Retrieved 4 August 2008. ^ a b "MissileThreat – "Hongqi-10 (HQ-10)"". Archived from the original on 5 April 2013. Retrieved 5 September 2008. ^ "Almaz Scientific Industrial Corporation – "FAVORIT S-300 PMU2 SURFACE-TO-AIR MISSILE SYSTEM"". Archived from the original on 27 January 2006. Retrieved 23 June 2006. ^ a b "Зенитно-ракетная система С-300В (СССР/Россия)". www.modernarmy.ru. Retrieved 21 July 2017. ^ a b "Ракетный комплекс С-300В4 пополнит ВС России". Российская газета. Retrieved 27 November 2015. ^ "C- 300В". guns.ru. Retrieved 27 November 2015. ^ "Federation of American Scientists – "S-300V SA-12A Gladiator and SA-12B Giant – Russia/Soviet Nuclear Forces"". Retrieved 5 September 2008. ^ a b c "S-300V, SA-12A GLADIATOR and SA-12B GIANT, HQ-18". Retrieved 14 November 2014. ^ "C- 300В - Пусковая установка 9А83 и 9А82". guns.ru. Retrieved 1 April 2015. ^ Евгений Даманцев. "Перевес стратегического баланса сил на Ближнем Востоке снова стремится к России". army-news.ru. Retrieved 27 November 2015. ^ "C- 300В - Многоканальная станция наведения ракет 9С32". guns.ru. Retrieved 1 April 2015. ^ a b "Универсальная зенитная ракетная система С-300В". topwar.ru. Retrieved 1 April 2015. ^ "S-300V SA-12A GLADIATOR and SA-12B GIANT HQ-18". FAS.org. 30 June 2000. Retrieved 2 February 2015. ^ "Russian army to receive advanced weaponry in 2011 | Defense | RIA Novosti". En.rian.ru. 28 February 2011. Retrieved 14 November 2011. ^ a b "Зенитно-ракетная система С-300В / С-300ВМ Антей-2500". Retrieved 14 November 2014. ^ a b Administrator. "S-300VM Antey-2500 SA-23 Gladiator Giant data pictures video - Russia Russian missile system vehicle UK - Russia Russian army military equipment vehicles UK". www.armyrecognition.com. ^ "Модернизация до уровня ЗРС С-300В4 ПВО сухопутных войск полностью завершится в 2012 году". Retrieved 21 July 2017. ^ "С-300 обновили до С-400". Российская газета. Retrieved 21 July 2017. ^ Plopsky, Guy (19 January 2017). "Are Russia's Lethal S-400 SAMs Equipped with the Latest Long-Range Missiles?". ^ "Задача трудная, но решаемая - Журнал "Воздушно-космическая оборона"". vko.ru. Archived from the original on 13 December 2015. Retrieved 27 November 2015. ^ "МО РФ: ЗРС С300В4 подтвердила способность поражать цели до 400 км". РИА Новости. Retrieved 27 November 2015. ^ "Создана новая зенитная система "Антей-4000"". Российская газета. Retrieved 21 July 2017. ^ Kopp, Dr. Carlo (May 2009). "Almaz-Antey 40R6 / S-400 Triumf Self Propelled Air Defence System / SA-21 Самоходный Зенитный Ракетный Комплекс 40Р6 / С-400 "Триумф"". AusAirPower. Carlo Kopp Updated February 2010 Updated May, June 2011 Updated April 2012. ^ a b c d e f "- -". Archived from the original on 26 September 2011. Retrieved 14 November 2014. ^ "Antiaircraft missile system series S-300П | the History of air and MISSILE defense". Archived from the original on 29 June 2013. THE S-300V – first mobile universal system of missile and anti-aircraft defense. ^ a b Dr Carlo Kopp, PEng. "76N6 Clam Shell Low Altitude Acquisition Radar / 5N66/5N66M/76N6/76N6E/40V6M/MD Clam Shell". ausairpower.net. Archived from the original on 8 December 2015. Retrieved 27 November 2015. ^ a b Not a GRAU index. GRAU indices only apply to land-based versions. ^ "С-400 vs Patriot: в чем американцы уступают нашим ЗРС". 28 April 2015. Retrieved 21 July 2017. ^ сборник, БАСТИОН: военно-технический. "НЕВСКИЙ БАСТИОН, ВОЕННО-ТЕХНИЧЕСКИЙ СБОРНИК, ВООРУЖЕНИЯ, ВОЕННАЯ ТЕХНИКА, ВОЕННО-ТЕХНИЧЕСКИЙ СБОРНИК, СОВРЕМЕННОЕ СОСТОЯНИЕ, ИСТОРИЯ РАЗВИТИЯ ОПК, БАСТИОН ВТС, НЕВСКИЙ БАСТИОН, ЖУРНАЛ, СБОРНИК, ВПК, АРМИИ, ВЫСТАВКИ, САЛОНЫ, ВОЕННО-ТЕХНИЧЕСКИЕ, НОВОСТИ, ПОСЛЕДНИЕ НОВОСТИ, ВОЕННЫЕ НОВОСТИ, СОБЫТИЯ ФАКТЫ ВПК, НОВОСТИ ОПК, ОБОРОННАЯ ПРОМЫШЛЕННОСТЬ, МИНИСТРЕСТВО ОБОРОНЫ, СИЛОВЫХ СТРУКТУР, КРАСНАЯ АРМИЯ, СОВЕТСКАЯ АРМИЯ, РУССКАЯ АРМИЯ, ЗАРУБЕЖНЫЕ ВОЕННЫЕ НОВОСТИ, ВиВТ, ПВН". nevskii-bastion.ru. Retrieved 21 July 2017. ^ "Гамма-ДЕ - Алмаз-Антей". www.almaz-antey.ru. Archived from the original on 20 May 2017. Retrieved 21 July 2017. ^ сборник, БАСТИОН: военно-технический. "ВООРУЖЕНИЯ, ВОЕННАЯ ТЕХНИКА, ВОЕННО-ТЕХНИЧЕСКИЙ СБОРНИК, СОВРЕМЕННОЕ СОСТОЯНИЕ, ИСТОРИЯ РАЗВИТИЯ ОПК, БАСТИОН ВТС, НЕВСКИЙ БАСТИОН, ЖУРНАЛ, СБОРНИК, ВПК, АРМИИ, ВЫСТАВКИ, САЛОНЫ, ВОЕННО-ТЕХНИЧЕСКИЕ, НОВОСТИ, ПОСЛЕДНИЕ НОВОСТИ, ВОЕННЫЕ НОВОСТИ, СОБЫТИЯ ФАКТЫ ВПК, НОВОСТИ ОПК, ОБОРОННАЯ ПРОМЫШЛЕННОСТЬ, МИНИСТРЕСТВО ОБОРОНЫ, СИЛОВЫХ СТРУКТУР, КРАСНАЯ АРМИЯ, СОВЕТСКАЯ АРМИЯ, РУССКАЯ АРМИЯ, ЗАРУБЕЖНЫЕ ВОЕННЫЕ НОВОСТИ, ВиВТ, ПВН". bastion-karpenko.ru. Retrieved 21 July 2017. ^ "RusArmy.com - Радиолокационная станция "Оборона-14"". www.rusarmy.com. Retrieved 21 July 2017. ^ "RusArmy.com - Радиолокационная станция "Небо"". www.rusarmy.com. Retrieved 21 July 2017. ^ "Вестник ПВО :: С-300ПТ". guns.ru. Retrieved 1 April 2015. ^ a b "Вестник ПВО :: ЗРС С-300П". guns.ru. Retrieved 1 April 2015. ^ "Зенитно-ракетная система C-300ПС (C-300ПМУ )". new-factoria.ru. Retrieved 1 April 2015. ^ "Зенитная ракетная система С-300П". topwar.ru. Retrieved 1 April 2015. ^ "Сильные и слабые стороны самого опасного для противников Асада зенитно-ракетного комплекса". rusplt.ru. Archived from the original on 3 April 2015. Retrieved 1 April 2015. ^ "Lenta.ru: Наука и техника: Минобороны РФ закупает надувные зенитные комплексы". Retrieved 14 November 2014. ^ Редактор. "Надувные макеты на службе армии". army-news.ru. Retrieved 27 November 2015. ^ a b "Зенитно-ракетная система C-300ПС (C-300ПМУ )". Retrieved 14 November 2014. ^ a b c "Зенитно-ракетная система C-300 ПМУ-1". Retrieved 14 November 2014. ^ "МО РФ: ЗРС С300В4 подтвердила способность поражать цели до 400 км". РИА Новости. Retrieved 1 April 2015. ^ "Patriot TMD". GlobalSecurity. Retrieved 17 August 2010. ^ "Main defense product range - "Almaz – Antey" Corp". Archived from the original on 24 April 2013. Retrieved 22 August 2018. ^ a b "Зенитный ракетный комплекс Patriot PAC-3". Retrieved 14 November 2014. ^ a b c "11.04.12 c -3 -3". Retrieved 14 November 2014. ^ John Pike. "Patriot TMD". Retrieved 14 November 2014. ^ a b c d e "Lockheed Martin Patriot PAC-3". Retrieved 14 November 2014. ^ a b c d e "-300 -1". Retrieved 14 November 2014. ^ a b "/". Retrieved 14 November 2014. ^ a b ARG. 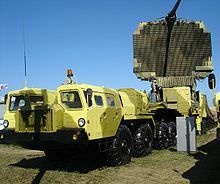 "S-300PMU-2 Favorit Long-Range Air Defense Missile System - Military-Today.com". www.military-today.com. ^ ARG. 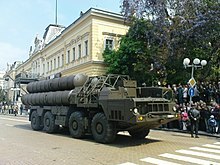 "S-300V Long-Range Air Defense Missile System - Military-Today.com". www.military-today.com. ^ "Зенитно-ракетная система C-300 ПМУ-2 'Фаворит'". Retrieved 14 November 2014. ^ a b "С-300 (SA-10, Grumble), зенитная ракетная система и ее модификации". arms-expo.ru. Retrieved 1 April 2015. ^ "20 лет назад Вооруженные силы России потрясли мировое сообщество". Российская газета. Retrieved 27 November 2015. ^ "Зенитно-ракетная система С-300В / С-300ВМ Антей-2500". new-factoria.ru. Retrieved 1 April 2015. ^ a b "Зенитная ракетная система С-400 "Триумф" в 3 раза эффективнее аналогов". Росбалт. Retrieved 1 April 2015. ^ Miroslav Gyürösi. (11 March 2005). 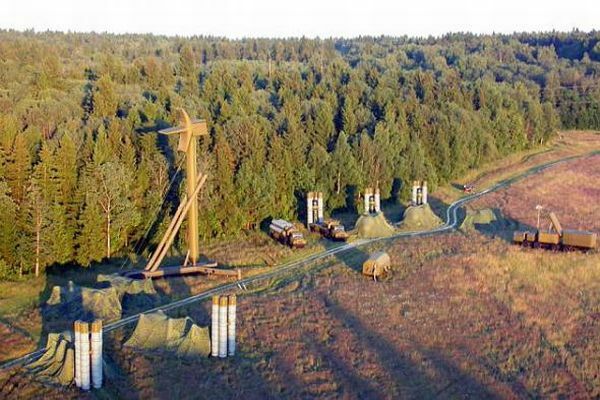 "the Slovak SA-10 radar set to participate in NATO exercise". Jane's Missiles and Rockets. ISSN 1365-4187. Retrieved 19 July 2006. ^ "Slovak radar missile systems s-300PMU will take part in NATO exercises". Archived from the original on 24 January 2012. Retrieved 12 August 2008. ^ "Israel 'close to deal on F-35'". Upi.com. 24 June 2009. Retrieved 14 November 2011. ^ "Israel orders U.S. stealth planes to counter Iran, Syria threat". En.rian.ru. Retrieved 14 November 2011. ^ "С-300 способны бить по наземным целям. Но белорусы их этому не учили". naviny.by. Retrieved 1 April 2015. ^ "U.S.: 'Russia has had S-300 in Abkhazia for Past 2 Years'". Civil Georgia. 12 August 2010. Retrieved 7 October 2017. ^ "Russia Begins Missile System Delivery to Syria, Warns West on Peace Talks". Reuters via VOA. 28 September 2018. Retrieved 29 September 2018. ^ Irish, John; Nichols, Michelle (28 September 2018). "Russia begins missile system delivery to Syria, warns West on peace..." Reuters. Retrieved 29 September 2018. ^ Nikolskaya, Polina; Gabrielle, Tétrault-Farber (25 September 2018). "Russia to give Syria S-300 air defense after accusations against..." Reuters. Retrieved 26 September 2018. ^ Barletta, Michael; Jorgensen, Erik; Saracino, Peter (July 1998). "The Russian S-300PMU-1 TMD System". James Martin Center for Nonproliferation Studies. Archived from the original on 10 November 2010. ^ "missilethreat.com". missilethreat.com. Archived from the original on 11 November 2011. Retrieved 14 November 2011. ^ "News from Armenia, Events in Armenia, Travel and Entertainment | Armenia Confirms Possession of Sophisticated Missiles". ArmeniaDiaspora.com. 20 December 2010. Retrieved 14 November 2011. ^ SIPRI Armstrade Register. Retrieved 27 October 2013. ^ "Russia completes S-300PS deliveries to Belarus". articles.janes.com. 14 June 2006. Retrieved 7 August 2011. ^ "Balkananalysis.com – "Balkan Defence Overview: Developments and Prospects "". Retrieved 5 September 2008. ^ "Sino Defence Today – "S-300 (SA-10) Surface-to-Air Missile"". Archived from the original on 10 September 2008. Retrieved 5 September 2008. ^ ""Рособоронэкспорт" поставит в Египет зенитные системы С-300ВМ". Рамблер-Новости. Retrieved 1 April 2015. ^ "ТАСС: Армия и ОПК – Источник: Россия поставит Египту полк систем ПВО "Антей-2500" до конца 2016 года". ТАСС. Retrieved 1 April 2015. ^ "В вооружениях не стесняться". kommersant. Retrieved 6 March 2018. ^ "According sources, Russia would start deliveries of Antey-2500 missile systems to Egypt". 6 March 2015. ^ Kommersant. "Те, кто сегодня критикует Иран, будут бороться за него". Retrieved 7 February 2018. ^ "Hellenic Air Force Weapons - S-300 PMU1". ^ "SIPRI Military Expenditure Database - SIPRI". www.sipri.org. ^ "Ballistic Missile Defence for India". www.bharat-rakshak.com. BHARAT RAKSHAK. Retrieved 27 July 2016. ^ "India's Missile Defense: Is the Game Worth the Candle?". thediplomat.com. THE DIPLOMAT. 2 August 2013. Retrieved 27 July 2016. ^ Behnam Ben Taleblu. "Understanding Iran's Deployment of the S-300 System". defenddemocracy.org. Retrieved 14 July 2017. ^ ваше имя. "Политика. Казахстан получит бесплатно до десяти комплексов С-300". Vesti.kz. Retrieved 13 August 2012. ^ "Казахстан и РФ подписали контракт на поставку дивизионов С-300". РИА Новости. Retrieved 27 November 2015. ^ "Россия безвозмездно поставит Казахстану пять дивизионов ЗРС С-300". Interfax.ru. 31 January 2014. Retrieved 27 November 2015. ^ "ТАСС: Армия и ОПК - Минобороны РФ безвозмездно передало Казахстану пять зенитно-ракетных комплексов". ТАСС. Retrieved 27 November 2015. ^ Eugene Yanko, Copyright 1997 – warfare.ru (10 August 1995). "SA-20 GARGOYLE / S300PMU/2/3 | Russian Arms, Military Technology, Analysis of Russia's Military Forces". Warfare.ru. Retrieved 23 September 2010. ^ "Новости NEWSru.com :: Россия прекращает выпуск ракетных комплексов С-300 и готовится участвовать в евроПРО с новейшими С-500". Newsru.com. Retrieved 13 August 2012. ^ "Модернизированная зенитная ракетная система С-300ПМ2". Archived from the original on 9 February 2016. ^ "Модернизация до уровня ЗРС С-300В4 ПВО сухопутных войск полностью завершится в 2012 году — ОРУЖИЕ РОССИИ, Информационное агентство". Arms-expo.ru. Archived from the original on 29 March 2012. Retrieved 13 August 2012. ^ "Минобороны РФ подписало трехлетний контракт на поставку ЗРС С-300В4 – Военный Обозреватель". Warsonline.info. Retrieved 13 August 2012. ^ "В Дамаске будут следить за переговорами Путина и Кэмерона". vesti.ru. 10 May 2013. Retrieved 13 October 2018. ^ "Russia slams end of EU arms embargo, calls S-300s 'stabilizing factor' in Syria". Retrieved 14 November 2014. ^ Walker, Shaun; McDonald-Gibson, Charlotte; Morris, Nigel (29 May 2013). "Russia stokes fears of an arms race with threat to deliver anti-aircraft missiles to Syria's Assad regime". The Independent. London. ^ "Russia Does Not Rule Out Backing Military Action in Syria – Putin / Sputnik international". Retrieved 14 November 2014. ^ a b "July 11th, 2012 - bmpd". livejournal.com. Archived from the original on 4 April 2015. Retrieved 27 November 2015. ^ "ЦАМТО: Сирийские ЗРС С-300 достигнут боеготовности не ранее конца 2014 года". vz.ru. Retrieved 21 July 2017. ^ "Moscow delivers S-300 missile system to Syria for defense of Russian naval base". Retrieved 21 July 2017. ^ "Russian S-300 Supplies to Syria to Boost Political Stability - Syrian Lawmaker". 20 April 2018. Retrieved 13 October 2018. ^ Путин обсудил с Асадом поставки российских комплексов С-300 в Сирию: В Кремле отметили, что президент сообщил сирийскому лидеру о дополнительных мерах по обеспечению безопасности военных РФ в республике TASS, 24 September 2018. ^ Израиль может попытаться помешать поставке С-300 в Сирию, считает эксперт RIA Novosti, 24 September 2018. ^ Devitt, Polina (2 October 2018). "Russia completes delivery of S-300 system to Syria". Reuters. Moscow. Archived from the original on 6 October 2018. Retrieved 6 October 2018. ^ Binnie, Jeremy; Ripley, Tim (5 October 2018). "Russia announces Syrian S-300 delivery". IHS Jane's 360. London. Archived from the original on 6 October 2018. Retrieved 6 October 2018. ^ "Three Russian S-300PM battalion sets delivered to Syria free of charge — source". 8 October 2018. Retrieved 13 October 2018. ^ John Pike. "Ukraine – Air Force Equipment". Globalsecurity.org. Retrieved 14 November 2011. ^ "Украинская рулетка: 20-летние С-300 попадают в цель один раз из четырех | Ракетная техника". Rbase.new-factoria.ru. Retrieved 13 August 2012. ^ "Путин рассказал про украинские С-300 в Крыму. Что с ними стало?". ^ Kroth, Olivia. "Venezuela's partnership with Russia: An emblematic step." Pravda, 23 June 2012. ^ "Asia Times – "Russian missiles to guard sky over Vietnam"". Retrieved 5 September 2008. ^ "96Л6-1 / 96Л6Е Всевысотный обнаружитель". militaryrussia.ru. Retrieved 27 November 2015. ^ Diplomat, Franz-Stefan Gady, The. "Vietnam Deploys Precision-Guided Rocket Artillery in South China Sea". ^ "Продажа комплекса С-300: расследование". 9 March 1995. ^ "ГОЗ по шасси для С-300В4 - новости от Кировского завода". livejournal.com. Retrieved 27 November 2015. ^ "Three Iranian long range air defense systems". Mashregh News Agancy. Archived from the original on 20 November 2014. 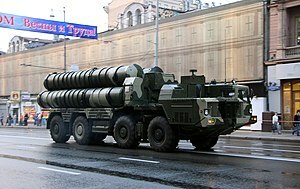 Wikimedia Commons has media related to S-300. S-300 and various other system (in English language) in the Russia (official developer site). "Antey 9K81 S-300V – SA-12A/B Gladiator/Giant". ausairpower.net. 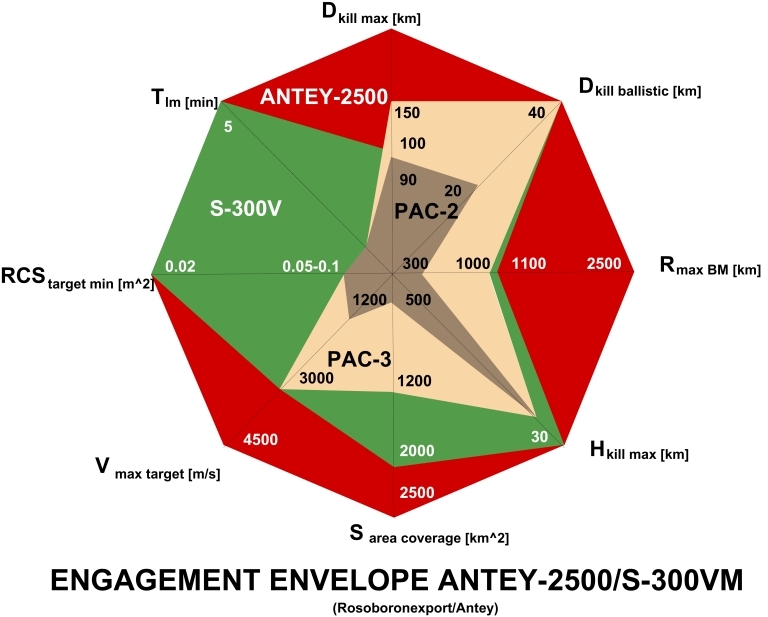 Matching of the Patriot (1/2/3) against the S-300 (v/ Antey 2500). In English. Used 8 parameters. Admonition. This test is are not officially authenticated but not refuted. 5P85-1 launcher for the S-300PT. S-300 launcher on parade in Sofia. Croatian S-300 system 1998 in Istria. A U.S. military photo of the S-300P (SA-10). S-300 at the 2009 Victory Day parade in Moscow. S-300 system operated by the Bulgarian military. KrAZ-260 tractor-trailer of a S-300PMU2 SAM system. S-300VM during a 2014 display in Caracas, Venezuela. The 5P85TE2 of an S-300PMU2 SAM on parade in Baku in 2011. S-300PS displayed in a Ukrainian Air Force museum in Vinnitsa. Transport-launch container with a 5V55 surface-to-air missile for the S-300P. A 64N6E2 reconnaissance radar, which forms part of the 83M6E2 command post of this S-300PMU-2 system. Three S-300PMU missile launchers in firing position. Displayed by the Slovak military in Piešťany. The 5P85-1 launcher for S-300PT displayed at the Air Defense History Museum in Zarya, Moscow Oblast. From left to right: the 64N6E2 radar, 54K6E2 command post, 5P85 missile launch vehicle, and the 9M96E2 missiles. A view of the deck area housing the S-300F vertical missile launchers on the Slava Class Guided Missile Cruiser Marshal Ustinov. Installing inflatable decoys of the S-300 during a Russian army exercise by the Guards Engineer Brigade and the Engineer Camouflage Regiment. 9S15M Obzor-3 round sight acquisition radar. 9S32 multichannel missile engagement guidance radar.